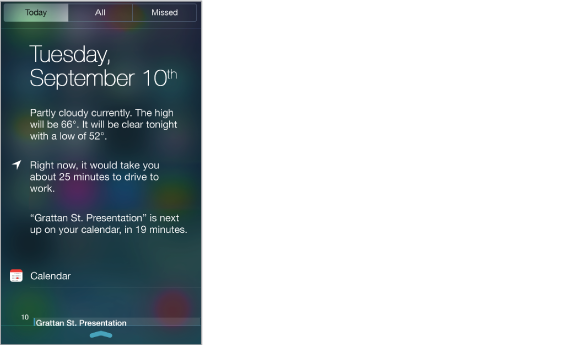 Notification Center collects your notifications in one place, so you can review them whenever you’re ready. Review all your alerts, or just the ones you missed. Or tap the Today tab for a summary of the day’s events—such as the weather forecast, traffic conditions for your commute (iPhone 4s or later), appointments, birthdays, stock quotes, and even a quick summary of what’s coming up tomorrow. Set notification options. Go to Settings > Notification Center. Tap an app to set its notification options. You can also tap Edit to arrange the order of app notifications. Touch , then drag it to a new position. Note: To include traffic conditions for your commute (iPhone 4s or later) in the Today tab, make sure Frequent Locations is turned on in Settings > Privacy > Location Services > System Services > Frequent Locations. Get government alerts. In some areas, you can turn on alerts in the Government Alerts list. Go to Settings > Notification Center. For example, in the United States, iPhone 4s or later can receive presidential alerts and you can turn AMBER and Emergency Alerts (which includes both Severe and Extreme Imminent Threat alerts) on or off (they’re on by default). In Japan, iPhone can receive Emergency Earthquake Alerts from the Japan Meteorological Agency. Government alerts vary by carrier and iPhone model, and may not work under all conditions.